Wenger, S. J., D. R. Leasure, D. C. Dauwalter, M. M. Peacock, J. B. Dunham, N. D. Chelgren, and H. M. Neville. 2017. Viability analysis for multiple populations. Biological Conservation 216:69-77. Dauwalter, D. C., K. A. Fesenmyer, R. Bjork, D. R. Leasure, and S. J. Wenger. 2017. Satellite and airborne remote sensing applications to freshwater fisheries. Fisheries 42(10):526-537. Decisions regarding the allocation of scarce resources are integral to the management of imperiled species. Managers need to determine what restoration activities will have the most benefit, where reintroductions are most feasible, and when to cease interventions in locations where persistence is highly unlikely. For many imperiled taxa, these kinds of decisions are made without the benefit of the most essential information: quantitative estimates of population viability. 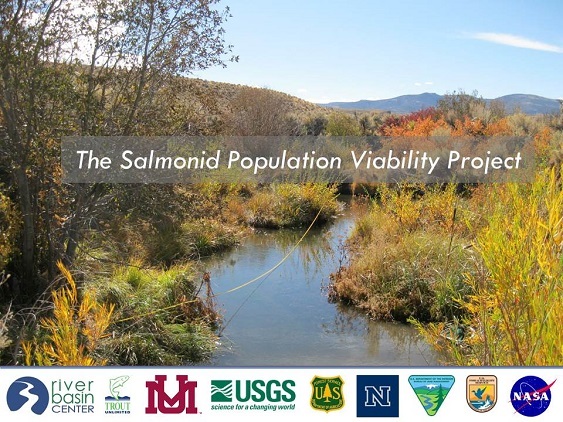 The goal of this project is to improve decision making for imperiled species by developing and applying novel methods of population viability analysis (PVA) that can be applied even for populations with limited available data. We have developed a new approach to population viability analysis, through a statistical spatio-temporal population model (ST-PVM) providing a fully integrated and flexible system capable of estimating persistence probabilities of multiple populations simultaneously, under current and alternative future conditions (e.g., with different management actions or climates). 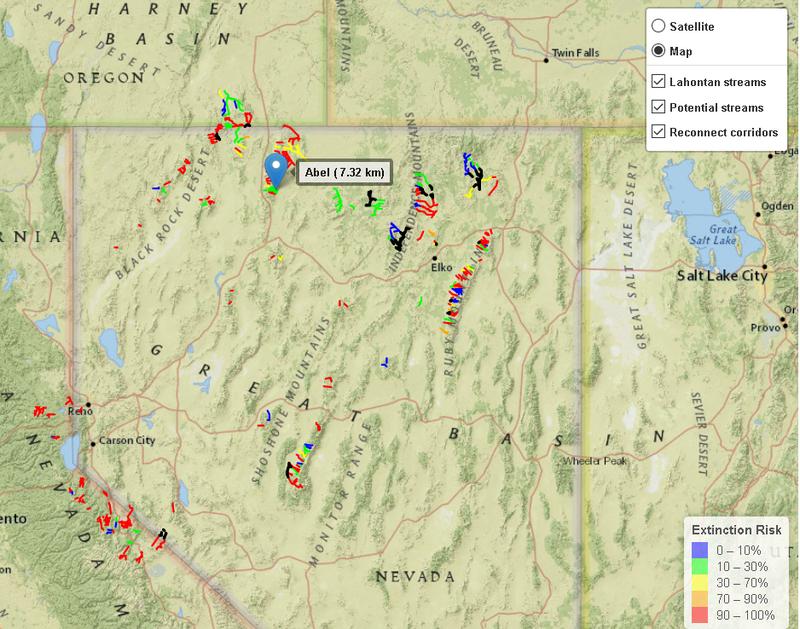 The models utilize all forms of actual field data (i.e., field data collected by the agencies and other partners). Simultaneous estimation across all populations lets us "borrow" information across many observations in space and time to estimate viability for populations for which there are little or no data. The models can incorporate landscape variables, many of which can be acquired from remote sensing (e.g., satellite-derived imagery). The use of land-scape level covariates lets us explore which variables most affect viability, as well as to project viability based on future climate scenarios. The models allow for evaluation of proposed management actions, such as riparian restoration, barrier removal, flow augmentation, or reintroduction, and can include effects of disturbance such as fire or prolonged drought. 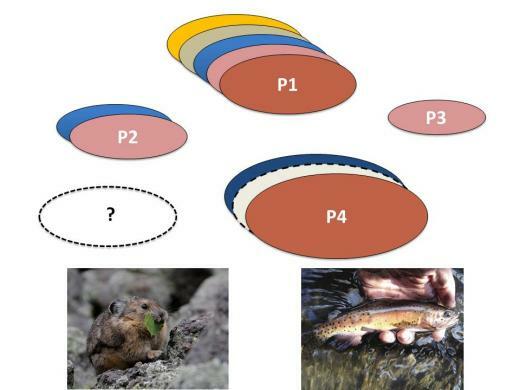 The models can be applied to any species with isolated populations, and outputs can be incorporated into numerous decision support systems – they are not tied to any one system. 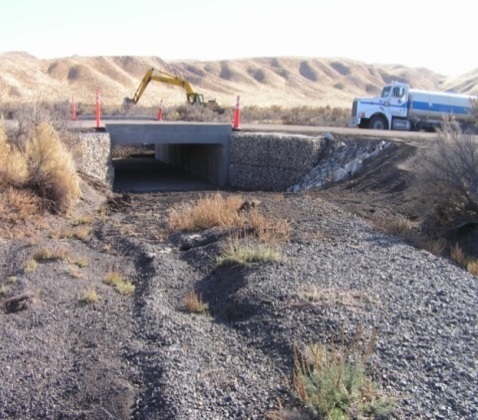 We are using ST-PVM to provide guidance for strategic management and reintroduction actions of the federally threatened Lahontan cutthroat trout (Oncorhynchus clarkii henshawi), in close cooperation with the Nevada Department of Wildlife, Oregon Department of Fish and Wildlife, California Department of Fish and Wildlife, Bureau of Land Management, US Forest Service, and US Fish and Wildlife Service. 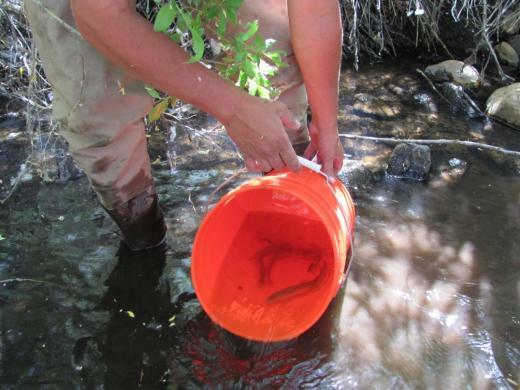 We are also beginning to apply ST-PVM to Bonneville cutthroat trout (Oncorhynchus clarkii utah) and interior redband trout (Oncorhynchus mykiss subspecies) as well, in collaboration with the relevant conservation teams consisting of various state and federal agencies. Primary partners: University of Georgia, US Geological Survey, US Forest Service Rocky Mountain Research Station, University of Nevada, University of Montana, Bureau of Land Management. 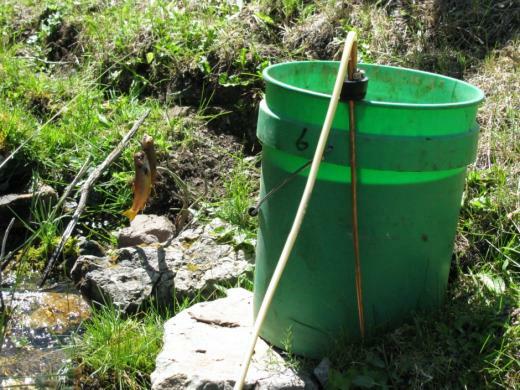 End-users: Nevada Department of Wildlife, Oregon Department of Fish and Wildlife, California Department of Fish and Wildlife, Idaho Department of Fish and Game, Utah Division of Wildlife Resources, and US Fish and Wildlife Service. Figure 1. The models use detailed field data and can incorporate different sampling situations, applying modeled relationships from well-sampled populations (P1) to estimate the dynamics and extinction risk of poorly sampled populations (P2-4) or even unoccupied habitats (white dashed oval). They can be applied to any species in relatively isolated habitats. Figure 2. An example of remote-sensing imagery available from NASA satellites that can be used by the models. 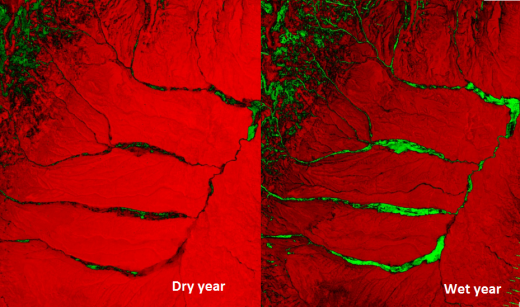 Normalized Difference Vegetation Index (NDVI) reflects riparian greenness in a dry year (left) and wet year (right).